The Musée de Cluny, officially known as Musée National du Moyen Âge (National Museum of the Middle Ages), is a museum in Paris that my husband and I visited on our recent trip to France. It is located in the 5th arrondissement south of the Boulevard St. Germain. Now I have to admit that we went to it on our first day in Paris primarily because it was within close walking distance to our hotel. But I’m sure glad we did. The structure in which the museum is located was amazing. It is an outstanding example of civic architecture in medieval Paris. It was formerly the town house (hôtel) of the abbots of Cluny, started in 1334. The structure was rebuilt by Jacques d’Amboise, abbot of Cluny in 1485-1510. It combines Gothic and Renaissance architectural elements. In 1843 it was made into a public museum, to contain relics of France’s Gothic past. (This is according to official site information). The most famous holdings in the museum are the famous six “Lady of the Unicorn” tapestries from the fifteenth century, often considered one of the greatest works of art of the Middle Ages in Europe. Their condition is absolutely amazing and the colours are as brilliant as if they had been created yesterday let alone over 600 years ago! Of course in order to keep their condition that way they are under very low light so it is impossible to photograph them without a flash which they do not allow. I was however able to take a photo of a different tapestry as you see to your left. What is special about this one is that I sold the reproductions of this tapestry when I had my store. I had no idea how large or how beautiful it truly was. 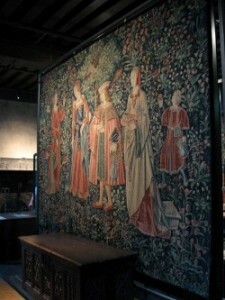 So, if you’re in Paris and you like textiles and uncrowded museums the Cluny is for you!